OpenTTD is an open source simulation game based upon the popular Microprose game “Transport Tycoon Deluxe”, written by Chris Sawyer. It attempts to mimic the original game as closely as possible while extending it with new features. 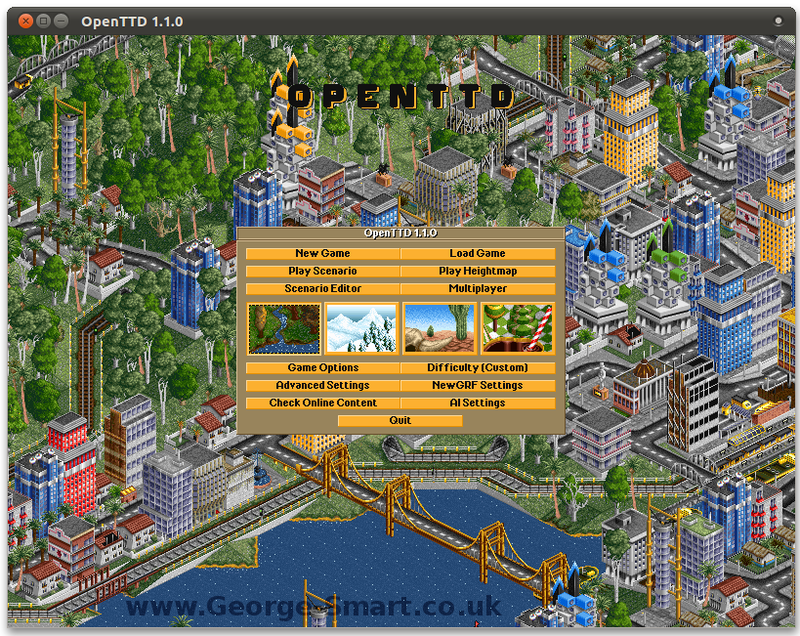 OpenTTD is licensed under the GNU General Public License version 2.0. This page aims to explain how to install OpenTTD under Ubuntu. I have used Ubuntu 10.10 Maverick. As you may or may not be aware, you need two key things to play OpenTTD. The game engine, OpenTTD, can be downloaded from the main website, at http://www.openttd.org/en/. You also need the graphics sets. These can be found by searching Google. A suggested search would be “ttd-win.zip”. You can also get the required files from CD and must own the game (and therefore the rights to use of the original graphics sets). As I say, these can be found by a quick Google – to save hunting for my install CD, I downloaded the graphics sets from here, ttd-win.zip. If you downloaded the appropriate file (.deb) from the OpenTTD website, you should simply be able to double click and install. The version I installed was the latest stable at the time, Version 1.10 for 64bit machines. Done. When installing via Packages (.deb files), the installer usually creates a link to the game inside the menus. On my machine, this was found by following the Applications > Games > OpenTTD link. Alternatively you can simply run openttd from the command line.